You started your label in 2009 after becoming frustrated at not being able to find the right clothes for your own daughter, Mischka. Did you have a background in fashion? I actually never took a fashion-design course however I have loved fashion all my life, and always appreciated the intricate details and craftsmanship in couture fashion. The freedom to create something individually unique, exploring different techniques, processes and fabrics creating something beautiful is of the most importance to me. Those who buy Mischka Aoki know they are buying a beautifully created, meticulously crafted, one-of-a-kind piece of exceptional quality. Can you tell us more about some of your most famous creations – like the exclusive dress you created for Harrods last year, and the gown made for Beyoncé’s daughter, Blue Ivy? Last year we designed a lavish, one-of-a-kind dress adorned with genuine 24-karat gold flowers and hundreds of Swarovski crystals. This dress, being the couture piece that it is, perfectly blending both beauty and elegance, was designed for those yearning for the ultimate in luxury. The dress retails at £59,000 and is available exclusively at Harrods Department Store in London. Not long ago we dressed Blue Ivy for the VMA Music Awards in our “The Grand Royalle” dress, one of our limited-edition pieces. The bodice is made from gold metallic leatherette, which had been machine laser cut with a specific pattern, and embellished with 3D flower applique, which had to go through four different processes that takes days to make each; every single flower had to be done one by one, by hand. Beyoncé’s team wanted to make a very powerful impact for the grand entrance, so the brief was to do a very dramatic gown, to create something that is spectacular, amazing, luxurious and different. When we discussed the colour and style of the dress we decided that “The Grand Royalle” would be the perfect dress for the event. What is the process for creating a custom piece for a client? When the client contacts us the first time, they normally have an idea in mind; we provide advice to refine these ideas into an actual creation. This process alone can take days to weeks. We discuss every single detail, from the fabric and colour options to the embellishment that we would apply to the dress. Creating these dresses requires an artistic eye for fine detailing and skilful technique. Each dress is meticulously handcrafted, and it can take hundreds or thousands of hours on one dress alone. We source exclusive fabrics and also create our own in-house designs. Every dress has some form of intricate handwork, whether it be embroidery or luxurious embellishments. This entire process takes at least eight weeks from an idea to the dress being delivered. Can you tell us more about the concierge service? We created this service due to requests from some of our VIP customers, where they prefer to choose the dresses that they want from the comfort of their own residences/palaces. 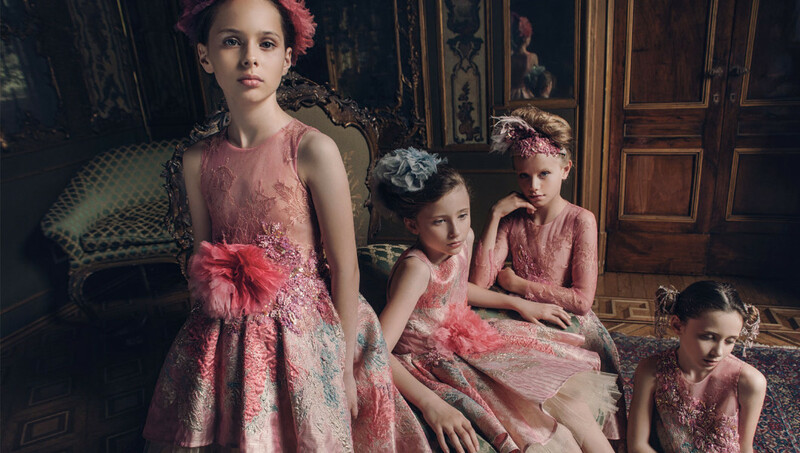 Are you focusing solely on haute couture for girls – what about the little gentlemen? Are you catering to the demand for “mummy and me” matching dresses? We have been offering our Mini Me collection since last year – a capsule of some of our best designs for the season in mother and daughter sizes to match. Your daughter must truly be one of the world’s best-dressed girls – does she enjoy dressing up as much as you enjoy designing these creations? She does. I think every little girl always wants to feel special and wants to be a little princess and my daughter is no exception. I’ve seen some fabulous photos of your son on Instagram – are you designing for him too? Not at the moment, but I enjoy styling him in stylish outfits and I usually keep him up to date with trends. You just opened a corner in Dubai’s Level Kids. Are there any exciting plans you can reveal for Mischka Aoki? Yes, of course. We always have new and exciting projects. At the moment we are in the process of finalising designs for another new store corner, which will be opening soon in the next few months, but lets keep it as a surprise for now! What about family time – where does the Aoki clan like to go to decompress? For me, family always comes first, so wherever I go they always come with me. This way I can always spend time with them whenever I am free. And when we do want to decompress, we always go to Paris. It feels like a second home now.